damming of Stony Brook in 1936. Over sixty years ago, a small corner of the Pratt Farm on East Main Street in Middleborough developed as a local Depression-era winter sports venue, a circumstance made possible through the generosity of Ernest S. Pratt. Though owned by Pratt, the site was, for a number of years (1936-41), under the care of the Middleboro Skating Club, an organization formed to foster winter sports locally. While the club was extremely popular at the time, memories of it and cold winter evenings spent skating under a mantle of stars, while recorded music permeated the crisp air, are rapidly fading. It seems appropriate that this corner of the Pratt Farm became a popular locale for winter sports. 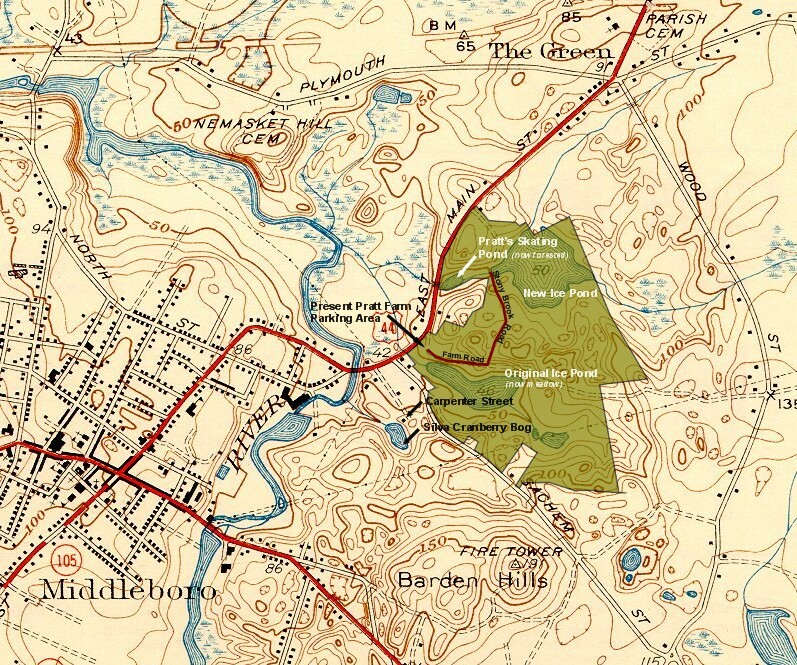 Pratt's sister, Louise Pratt, owned the first pair of skis in Middleborough which she used on the relatively tame slopes of nearby Pratt Hill. In 1936, Ernest Pratt, at the instigation of several local skaters including my grandfather Jim Maddigan, acquired a parcel of land adjoining the Pratt Farm on East Main Street for the use of local skaters. 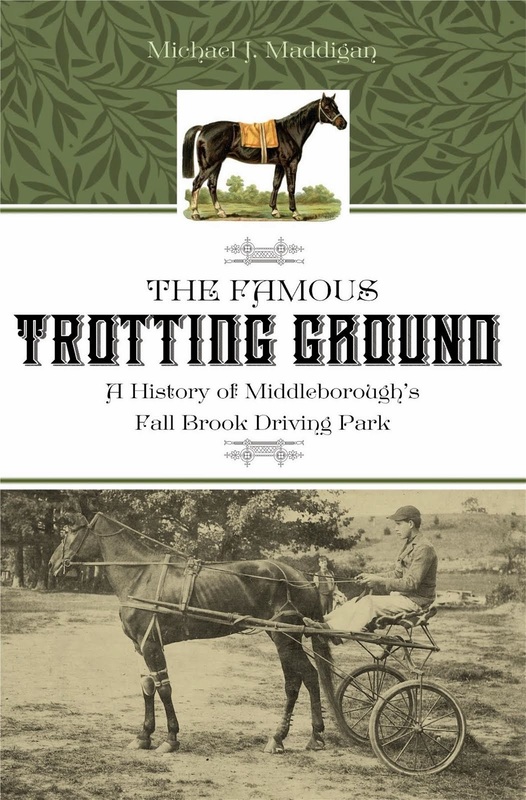 The Middleboro Gazette applauded Pratt's civic-mindedness and noted that "sincere appreciation has been voiced by local skaters for Mr. Pratt's generosity in providing this new location for with the exception of the river, which is rarely safe, and the ice ponds there are few opportunities to enjoy the sport." Despite Pratt's altruism, there was probably a more pragmatic reason behind his offer: keeping bothersome skaters off his ice ponds. Ice was big business for Pratt. "For more than forty years the principal crop [of the farm] was ice," recalled Pratt's wife Rose Standish Pratt years later. Skaters who therefore used Pratt's ice ponds during harvest were frequently an annoyance and, often, a liability for the business. My grandfather, nearly a lifelong resident of the Star Mills section of Middleborough and a one-time employee of Pratt's, explained: "There were areas established by Mr. Pratt that were off limits for skaters prior to and during the harvesting of ice. Some of the youngsters used stones for their hockey goal markers, and stones for hockey pucks. Many times these would be left on the ice and become frozen in. On occasions, rain or melting snow caused water to collect on the ice surface, freezing and completely covering and hiding any stones that were left there following their games. An object of this nature, buried in the ice, was a real hazard and could completely ruin the blade of the motorized saw used to mark the ice during harvesting." Consequently, continued my grandfather, when "one winter, in the mid-1930s, a group of skaters approached Ernest Pratt in hopes that he might consent to the installation of a small dam across the brook near East Main Street ... to create a skating pond, he readily accepted our proposal, probably under the impression that this location would keep most of the skaters off the ice pond." 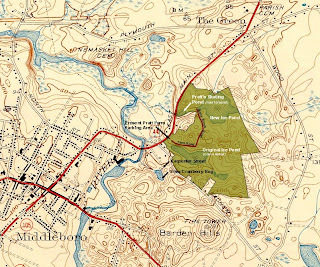 The site selected for the new skating pond was an area three hundred yards long by fifty yards wide located along Stony Brook which drained Pratt's newest ice ponds and flowed underneath East Main Street at the foot of Pratt's Hill. To foster winter sports at the site and to take formal charge of Pratt's skating pond, the Middleboro Community Skating Club was formed in late 1936, in the South Main Street barbershop of Alfred Hodder and Ela Anderson. 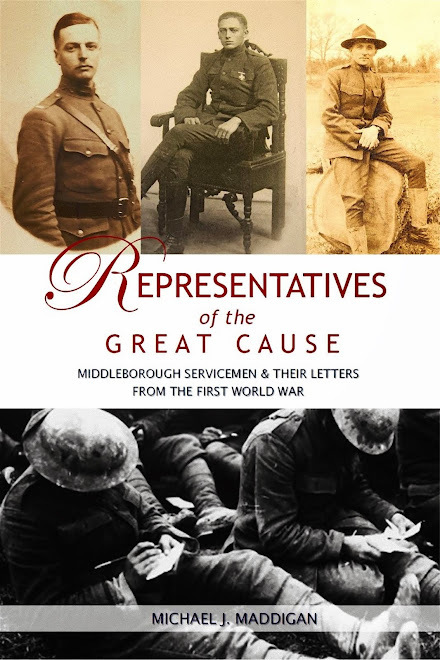 Officers of the club elected at this meeting included Hodder as president; Coach Henry Battis of Middleborough Memorial High School as vice-president; Adnah Harlow, secretary; and Dalton Penniman, treasurer. A fourteen person membership committee was also named, and Joseph Miskinis was charged with care of the new rink. (Harold Wood would later have care of the ice). Gazette editor and publisher, Lorenzo Wood, was appointed the club's publicity agent. 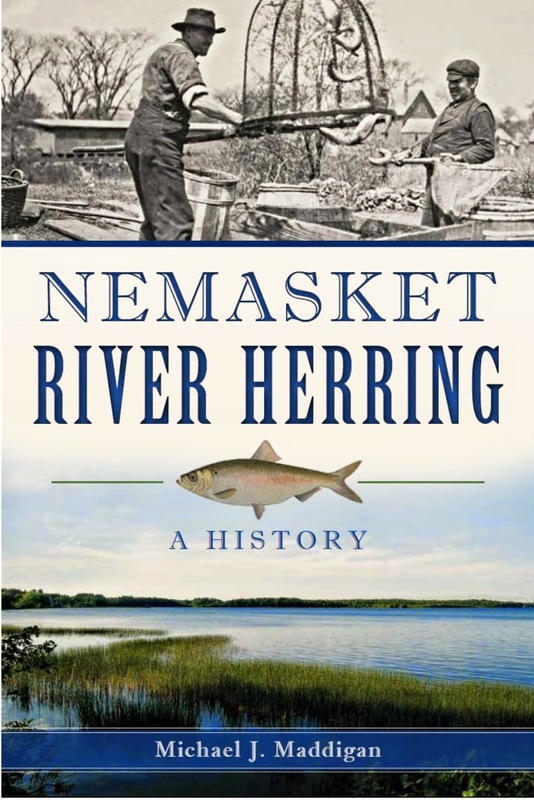 To formalize the arrangement, "use of the small pond was granted by Ernest Pratt, for a nominal fee - only enough to protect him and make it legal." Pond, USGS map, Bridgewater, Mass., 1940. Conservation Area are overlaid in green. The stated purpose of the Middleboro Skating Club was to oversee "centralizing Middleboro winter sports," primarily in the interest of the community's children. Some club members "were interested in skiing, some in tobogganing, some in fancy skating, others in hockey. [Nonetheless], all were aware of the benefits both young and old might derive from an organized winter sports center." 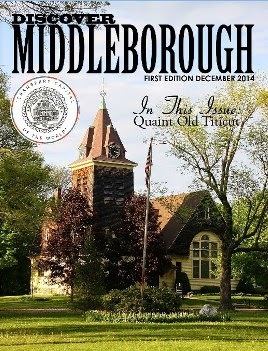 For five years, the Middleboro Skating Club would avidly pursue the goal of encouraging winter sports, and the club would become, at one point, the most popular in Middleborough, bragging that it had more members than any other in town. Ironically, creation of the club and the new skating pond failed to keep skaters from Pratt's ice ponds as intended. 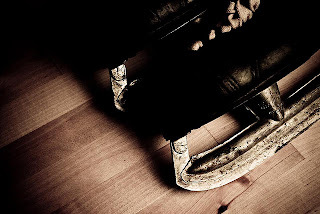 "I remember," recalled my grandfather, "one incident that took place during the skating season in the late thirties. A group of young people, mostly in their early twenties, arranged for a skating party, the girls bringing the hot dogs and rolls and the male members providing the fire for cooking, also the gathering of the forked sticks to be used for roasting the 'delicacies.' During the course of the evening, and following trips to the fire to warm up and partake in some refreshments, the skaters organized groups to skate together and play 'snap-the-whip.' This consisted of perhaps ten or twelve people, sometimes more, in a row holding hand, and skating down the ice, and on a given signal the so-called leader, usually a good skater, stopped and snapped the long line down the ice in a circular course. The skaters near the end of the line travelled at a good speed. On one occasion four of the group plunged into the open water created by the cutting of the ice during the day. They were in an area where the water was only about three or four feet deep, but very, very cold. They were assisted back onto the ice, loaded into two cars and transported to my house where my wife and I provided dry clothes and a hot drink. Needless to say we were very particular about choosing an area to perform our stunts after this experience." 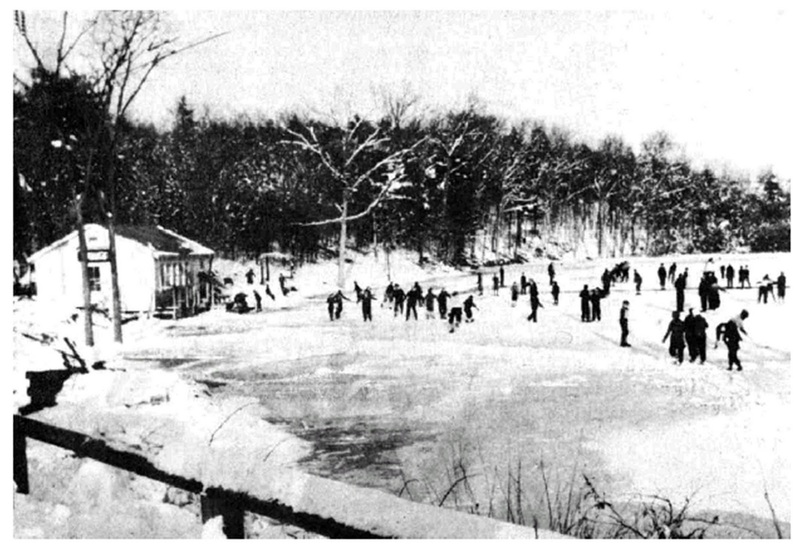 Following its November, 1936, organization, the Middleboro Skating Club grew rapidly, embarking upon fairly ambitious plans to erect a heated shelter at Pratt's skating pond and light the pond for night skating (all to be financed through expected memberships in the new club), and promoting the growth of ice hockey locally, through the formation of an adult team and sponsorship of a four-team youth league. Within two weeks of its foundation, the skating club boasted a membership of four hundred, and had commenced upon its construction projects. Nearly completed by Christmas, 1936, the club's furnished skating shelter was opened to members by the end of January, 1937. Jim Maddigan, a member of the skating club, left a description of the completed shelter: "The clubhouse provided a dry, warm area to change from street shoes to shoe skates, as well as a place to warm up cold hands and feet. Heat was generated by a wood stove near the center of the approximately 16 by 24 foot structure. Seating was provided by wooden benches on three sides of the building. At one end a small area was built to accommodate a portable electric stove where hot dogs and hamburgs were prepared and sold. There, also, was located a candy and soda concession." A loudspeaker broadcast records played in the clubhouse so that skaters might enjoy the music. Despite this propitious start, there were some early criticisms of the club centering upon the surface area of the proposed skating rink. In response, the Gazette wrote: "To those who are of the opinion that the skating surface is limited on this new pond it is pointed out that there are approximately two acres now covered and that with any larger area it would be impossible to keep the ice in first class condition. Snow must be removed from time to time and the skating surface renewed occasionally by additional flooding." 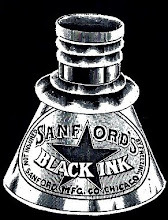 Nevertheless, the club decided to extend the skating surface an additional one hundred feet because of the increasing number of members - five hundred by mid-December, 1936. The debate over the expanse of the proposed skating surface was immaterial, at least during the first season. The winter of 1936-37 was among the mildest then on record and the skating pond never froze. The skating club's publicity agent, Lorenzo Wood, noted the remarkable progress the club had made since its inception, but wrote at the end of January, 1937, that "there still remains but one item - ice - to put the club into action." While the lack of ice certainly precluded skating on the pond, so too did construction problems with the dam built to impound the waters of Stony Brook. It washed out three times during the first winter, establishing itself as a chronic headache for the club. By the second season, however, the problematic issues of 1936-37 had been successfully addressed by the skating club and large numbers of skaters began enjoying the rink in January, 1938. To publicize conditions at the rink, notices detailing prevailing ice conditions were posted at Hodder and Anderson's barbershop on South Main Street, as well as at other prominent locations in town. One of the most promising developments of the Middleboro Skating Club was its support for the growth in local interest in ice hockey. Among the club's first events was a hockey game between club members and a team at East Bridgewater on December 8, 1936. Early attempts to formally establish a hockey team by the club, however, were frustrated by the mild winter of 1936-37. Nonetheless, ice hockey proved popular on Pratt's skating pond, so much so that there was some concern it might interfere with the more family-oriented activities at the site. My grandfather recalled "a strict rule that there would be no hockey playing, or wild antics, in the area where the small ones were skating, or learning to skate." The Gazette, too, cautioned skaters "to avoid unnecessary roughness in order that mishaps may be kept at a minimum." With the growing appeal of ice hockey, the Middleboro Skating Club's activities during the winter of 1938-39 not surprisingly focused upon the construction of a hockey rink at East Main Street. Sufficient funds were raised during 1939 to allow for the building of a rink on the upper end of the pond in December 1939, and January, 1940. The cost was $74.59 for lumber and nails. "Boards around the ends at the goals were installed, as well as goal cages. This helped to keep the hockey pucks confined to the playing area and also protected others skating on the pond." The natural amphitheater like surroundings provided seating for spectators. As part of its support for ice hockey, the skating club formed its own team which played opponents from Plymouth, Taunton, Dartmouth, Fairhaven, New Bedford and elsewhere. My grandfather, himself a member of the team, recalled one particular highlight. "On one occasion, members of the Rhode Island Reds, a farm team of the Bruins, came to Middleborough to play and have a practice session. They were good; rough and very fast. But we made an impression because some of the members did return to get a good workout." A four team youth hockey league was also sponsored, "giving the younger boys a chance to play." During the first months of 1940, a fortuitously prolonged cold spell further facilitated the local development of ice hockey. "In other seasons when a game was scheduled, it depended entirely on the condition of the ice. A few seasons ago, it was almost impossible to get in a match, because of abnormal weather conditions." John Sweeney, sports columnist for the Gazette, noted hockey's growing local appeal. "Hockey is forging to the front hereabouts," he wrote, adding somewhat over-optimistically that "hockey might conceivably edge out basketball as 'the' winter sport in this section." 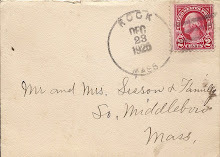 Despite the burgeoning local appeal of both ice skating and hockey fostered during the late 1930s and early 1940s by the Middleboro Skating Club, the club would disband in April, 1941, just four and a half years following its organization. Ironically, the club's difficulties were not financial. Upon its organization in November, 1936, the club had adopted a "pay as you go policy", paying for the construction of its facilities as they were built or expanded in order to avoid accruing indebtedness. Decidedly, this decision had made funds tight, so much so that in December, 1936, the Gazette was urging residents to join the club as "whatever funds have been taken in have already been used." To further finance its activities and facilities at Pratt's skating pond on East Main Street, as well as to fund the construction of the hockey rink and a proposed toboggan slide on Pratt's Hill, the skating club initiated an annual Tag Day appeal in 1938. The community was urged to generously support each year's appeal in the interests of the youngsters and families for which the club primarily had been founded. Ultimately, with membership fees, dues and tag day funds, the skating club was able to maintain a sound fiscal footing (as revealed by its treasurer's report for the 1939-40 season), and cover its expenses, the largest of which, annually, were for custodial wages and snow removal. However, the increase in membership in the skating club -necessary for the sake of financial solvency - brought with it "a decrease in those individuals willing to share in the responsibility of keeping things going." Progress made by the club in repairing the dam, improving the clubhouse, constructing the ice hockey rink, and purchasing snow removal and ice resurfacing equipment in the 1930s "was accompanied by an increasing lack of interest on the part of the leaders until only a few were left to share the responsibilities." The club leadership struggled on through the winter of 1940-41 in hopes of attracting new leaders to further local winter sports. "It seemed inadvisable under these conditions to continue ..., but with a knowledge of the disappointment this would cause and the hope that the unexpected might turn up these few individuals decided to give it one more try." In retrospect, it was the wrong decision. "The results were even more disastrous than anticipated. So bad in fact that continuation under the same conditions will be impossible." 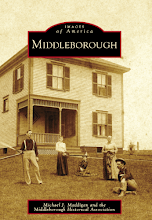 On April 7, 1941, with no prospective leaders forthcoming and the club's monthly expenses mounting, the Middleboro Skating Club met once more at Hodder and Anderson's barbershop, this time to formally disband. "In disbanding the officers want the public to know that the decision arrived at was anything but instantaneous. For two years, in addition to other duties at the rink, they have been trying to get other individuals or organizations interested but with very little success." skating pond site has returned to forest. 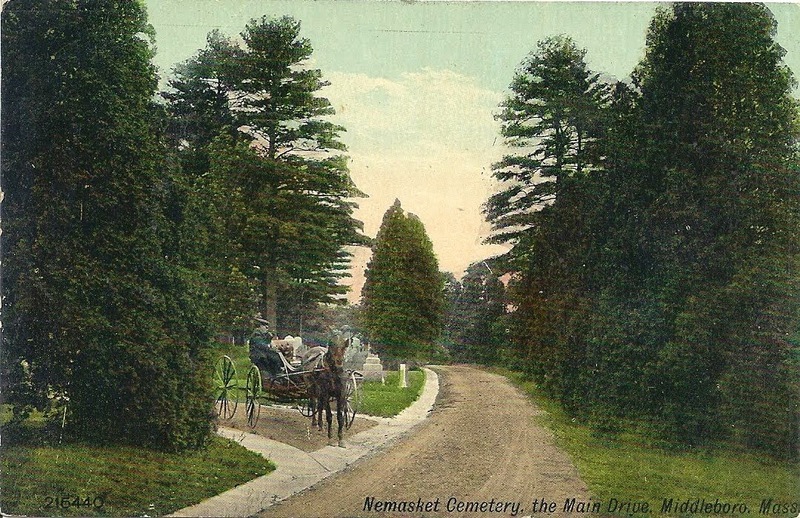 Because the original constitution of the skating club had indicated that in the event of such a dissolution, the club's property would be turned over to another town organization, and as it had been established primarily for the benefit of the youth of Middleborough, the skating club, in one of its final acts, moved to donate the East Main Street clubhouse to the Middleborough Memorial High School. "It is hoped that the clubhouse can be moved to the high school football field where it will be protected by the fence, to a large extent, from vandalism. It also will be in the proper spot to be used once again as a skating clubhouse, if it ever becomes possible for the original plan of a skating rink at the playground to go through." (Not until 1961 would such a rink be constructed). Despite the disbandment of the Middleboro Skating Club after only five years in existence, interest in skating and ice hockey remained high, and a number of attempts were made during the 1940s to recreate the success of the skating club. 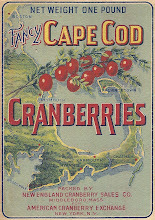 In late 1943, the Middleborough Board of Selectmen accepted an offer of Paul Silva to use his Carpenter Street cranberry bog as a public skating rink. The following year, selectman Benjamin J. Bump proposed spraying and flooding either the tennis courts or former football field at the Peirce Playground for use as a skating rink, a technique he had witnessed at Milton Academy. Soon afterwards, in November, 1944, the Kiwanis Club was granted permission to try to flood the old football field. It was a failure. In January, 1946, the Kiwanis Club, largely through the prodding of the Middleboro Skating Club's former president, Alfred Hodder, revived ice skating at the old East Main Street rink, reinstalling lights for night time skating. Hockey was once more played, this time "with teams comprising in large part returned service men." Ice skating would continue for a few years at the former Middleboro Skating Club rink before other pursuits attracted skaters elsewhere. The site was abandoned and decayed, returning to forest, and memories of soft winter evenings spent gliding across the ice at the Pratt Farm have faded. Cheers for this great pond hockey story. I was wondering whether you'd permit me to post the first photo of this post in my new http://vintagehockey.tumblr.com blog? I'd of course credit it and point a link here.